Evapotranspiration (ET) is the process of evaporation from plant and soil surfaces and from within plant tissues (i.e., water movement through stomata). What does the Tule Actual ET sensor do? Tule ET sensors are the only technology that can measure the Actual ET from your field. 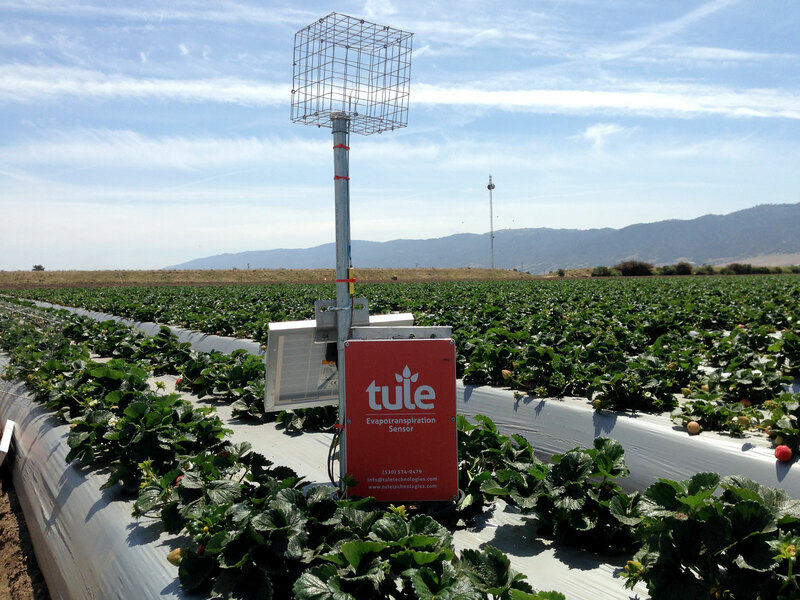 The Tule Actual ET sensor is a hardware device installed in your field above the plant canopy. The hardware device communicates to our server using a cellular connection. Tule reports the amount of water used by your field, your irrigation application amount, a forecast of atmospheric demand, and a recommendation for the amount of water to apply in the coming week based on your production goal. Why is Actual ET a valuable management tool? Actual ET tells you about the field -- not just one point in the soil or just one plant. You manage your ranch field by field, not plant by plant. Actual ET provides information at the scale of your management operations. Actual ET integrates the Soil-Plant-Atmosphere Continuum over a field. The Soil-Plant-Atmosphere Continuum is the movement of water from the soil, through the plant, and into the atmosphere, and eventually returned to the soil as rainfall. If the soil is not supplying enough water, the Actual ET decreases. If the plants close their stomata, the Actual ET decreases. If the air temperature cools, the Actual ET decreases. Actual ET provides the plant water stress level, known as the Plant Response Index (PRI). The PRI normalizes for changes in the weather. A decrease in the PRI means an increase in the water stress level, and correlates with other measures of plant water stress, like leaf water potential. How does Tule help you decide how much to irrigate? Actual ET is the amount water that is lost from a field. By knowing the Actual ET, you know how much water you need to apply to replace what the field lost. The Tule dashboard provides irrigation recommendations based on the previous week’s Actual ET and PRI, the forecast atmospheric demand, and our knowledge on the amount of water required to reach various production goals. How does Tule help you decide when to irrigate? The Actual ET of a field decreases when the plants have an inadequate supply of water in the soil. When the daily Actual ET decreases and the resultant PRI decreases, it may be time to irrigate again depending on your production goal. How does Tule provide feedback on your irrigation strategy? The Actual ET and PRI tell you how the plants are responding to your decisions on when and how much to apply. The Tule dashboard provides you with the Actual ET and the PRI, so you have insight to the stress on your crop. Can Tule tell me when to start irrigating for the season? In order to determine when to start irrigating, the Tule dashboard will provide you with a recommendations for when to start irrigating based on decreases in the Actual ET and PRI. As the available water in the soil decreases, the plants limit their water use in response to the deficit, and the Actual ET and PRI decrease. For perennial crops in regions with stored winter rainfall in the soil profile, it can be difficult for growers to know when the available water in the soil profile is no longer sufficient and the first irrigation event is required. How does Actual ET compare to CIMIS / Reference ET? Actual ET is the evapotranspiration from your field. The California Irrigation Management Information System (CIMIS) provides Reference ET. Reference ET is the evapotranspiration from a well-watered grass field at the nearest CIMIS station. The data from CIMIS is used in conjunction with a crop coefficient to calculate the water use of a hypothetical fully-irrigated crop field. Reference ET and crop coefficients do not provide you with feedback on the response of your specific field to your irrigation applications and whether you should be applying more or less water. Tule, on the other hand, provides the Actual ET from your field without requiring any crop coefficients or calculations. Tule reports the amount of water used by your field, your irrigation application amount, a forecast of atmospheric demand, and a recommendation for the amount of water to apply in the coming week based on your production goal. Because CIMIS has provided Reference ET data for years, people are familiar with Reference ET. In fact, many people are so familiar with CIMIS Reference ET that they often use ‘ET’ as a shorthand term for Reference ET. At Tule, we use the term Actual ET to emphasize that we provide ET measurements for your field (Actual ET) -- not estimations for a well-watered grass field somewhere down the road (Reference ET). 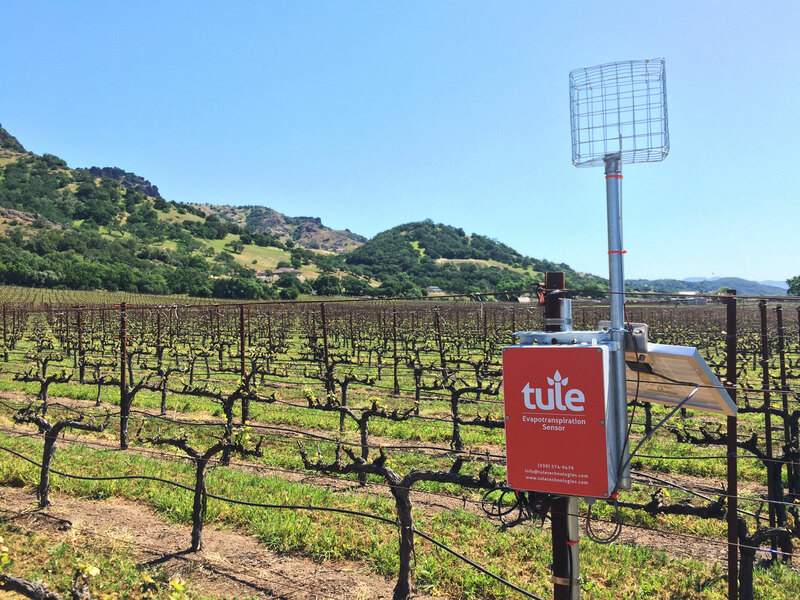 How does Tule compare to other monitoring devices (i.e pressure chambers, soil moisture sensors, etc)? Tule Actual ET sensors are the only irrigation management technology that can measure the crop water use at the field scale. Other irrigation management technologies, such as soil moisture sensors or pressure chambers, 1) cannot tell you how much water your plants are using and 2) cannot measure over the area that you irrigate and 3) in many cases, require a person in the field to make the measurement. These other point-based technologies only tell you about the one plant or bit of soil that you are sampling. Is this like a weather station? No. A weather station cannot tell you how much water your field used. Tule Actual ET sensors are the only technology that can measure the Actual ET from your field. A weather station tells you what you already know. For example, if there is a heat spell, a weather stations will tell you the air temperature is hot. In contrast, Tule tells you how much water your plants are using in the heat spell and how much water you need to apply back to the field. Tule Actual ET sensors do not provide basic environmental variables, like air temperature and wind speed. We use a recent innovation in atmospheric science from the University of California at Davis to measure Actual ET. This innovation was validated against lysimetry and eddy covariance. From a technical perspective, Tule uses the Surface Renewal method to measure how much water vapor the wind is carrying away from the field. If you’d like a more in depth look at the technology, please let us know. Our team will work with you to identify the best locations for Tule sensors on your ranch. We will then install the hardware devices in your field above the plant canopy to measure both the daily Actual ET from the vineyard and the irrigation applications. We connect a sensor to your irrigation system to measure your water applications. The Tule hardware device communicates to our server using a cellular connection. After installation, we will provide you with a user login to our web dashboard for viewing the data and irrigation recommendations. How do I receive and interact with the data? On your smartphone or tablet through our mobile-friendly interface. Our system is very intuitive and easy to use, so training is not required. We do offer technical support should you have any questions. Some pricing tiers offer optional technical training groups that are organized quarterly to review how to push the use of Actual ET data to optimize production and learn from other intermediate and advanced Tule users. Will it interfere with management operations? The hardware device is installed within your field and above the plant canopy. For most management operations, the device does not interfere with operations. If you are passing over the canopy for sprays or harvest, the hardware device may need to be temporarily removed. Please ask about whether or not temporary removal of the hardware will be necessary for your management operations. How are other growers using Actual ET and the Tule service? Growers use the Actual ET data and Tule’s recommendations to determine how much water they need to replace to the field with an irrigation event. To maximize yield, the grower replaces to the field the amount of water that was lost from the field via evapotranspiration. During some stages of crop development within a season, the grower may decide to induce moderate water stress to achieve a production goal, so he or she only applies a portion of what was lost via evapotranspiration. Growers also use the Actual ET data to inform when to irrigate. Actual ET and PRI decrease as the plants respond to inadequate water availability in the soil. A decrease in Actual ET and PRI tell the grower it is time to irrigate again. Please contact us for a stepwise tutorial on how to use the data to inform you irrigation decisions. 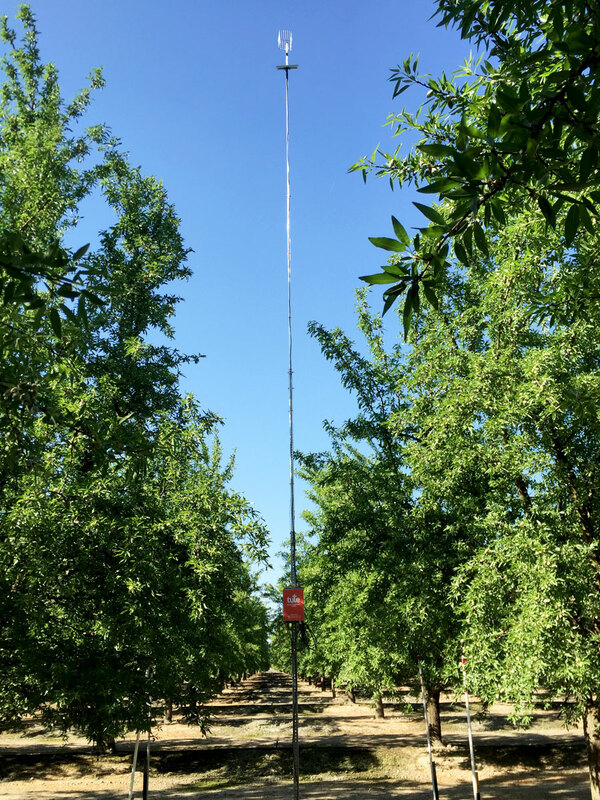 What does it look like when installed in a field or orchard? For a Demo of the Full Suite of Tule Features, Please Contact Us.